Ro- Or Nanobot, Who Cares ? 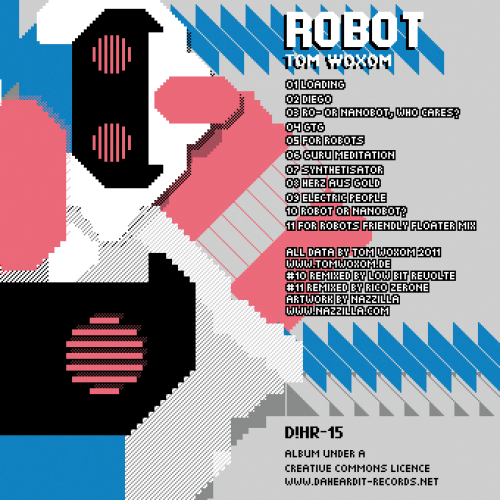 Robot is the 2nd album from the German artist Tom Woxom, and marks the 15th release from Da! Heard It Records. This album is more personal and more polished : the Amiga 500 specialist has added a pinch of Gameboy Classic and some Commodore 64. Dedicated robot rights activist, Tom Woxom devotes this album and most of its tracks to them. He fights for a more equal world, and freedom of the robots. It’s an 8-bit electro work, which some will sometimes venture to call “technoid”, the perfect word to conceptualize his artistic approach. As in his first album, Tom used sounds generated directly by his Amiga, the C64 or the DMG-01 and modified them in several ways. Best Amigavocals through a Vocoder. Just taking one track, Ro or Nanobot, who cares? is a perfect example of Tom using his Amiga 500 for vocals. Amiga sonorities arranged in throbbing rythms set this track apart by its clarity and beauty. A bit of help by Low Bit Revolte during post-prodution rendered the end product more sleek and sparkly. Robot is an personal, almost intimate album but Tom Woxom nonetheless he is honored by Low Bit Revolte and Rico Zerone remixing two of his tracks. Undeniably, Robot has opened a new page in Tom’s book of music. One definitely recognizes the mark of the artist, refined, affirmed and enriched by his artistic research.